Since I started Remote Year, I have had my eyes on visiting the Salt Flats in Bolivia. I knew when I was in Peru or Argentina, that would be my best chance. When it came time to organize the trip, it was decided that Peru would be the spot to leave from. Not only would Peru be the leaving spot, but also, I would head there on our transition day instead of heading to Córdoba with the group, which would be a first. I would be accompanied by my girlfriend and we would head to Bolivia the Friday night of our typical Remote Year travel weekend. Our flight was around 10PM and we would flight from Lima to La Paz Bolivia. This trip was one that took some strategic planning. We were going to the Salt Flats and doing it on travel weekend, so we had to have all our luggage with us instead of asking someone to take it for us. So, here is what we did. We got into La Paz at 1AM with all our luggage. We got through the Visa process which required some paperwork, and most importantly $160 in crisp US Dollars. We had a plan to ditch our luggage and only take our backpacks to the Salt Flats. Our flight for the Salt Flats was at 7:10AM so we had some time. We found a cab and explained in Spanish that we would like a ride to our hotel that we would be staying in when we get back to La Paz, drop our bags off there for them to hold for us and come back to the airport. We got in the cab, and took the 45-minute ride to our hotel and dropped off our bags, then got back to the airport around 3:30AM, with a few hours to kill before our flight. We were both tired, and wanted to try and rest our eyes. Low and behold, in the airport there was a place where you could pay for a bed to sleep in. I had never seen anything like this and we quickly decided this would be a great way to rest before our trek into the Salt Flats. We paid the man, and he lead us into a room that had a set of bunk beds in it. I hopped into the top bunk and quickly laid my head down. I had a little bit of a hard time falling asleep but finally did. We let the man know we would be out at 5:30AM and he had to knock hard on our door at that time to wake us up. We got out of there with a little bit of rest and hopped on our flight to Uyuni to start our 3 Day 2 Night trek of the Salt Flats and the area around it. We boarded a little plane, and after about a 45-minute flight we were in Uyuni. The airport is tiny, and has 2 gates. When they take your luggage off the plane, they load it on to a cart, and then manually pull the cart about 100 feet to the gate for you to get it. We arranged for a cab ride from our tour company and a man was standing there with a sign with our names on it. We headed to the office of Red Planet Expeditions where we would check in for our tour. We got the lowdown on our trek and prepped our stuff. We would leave in about 2 hours from there to start the journey. 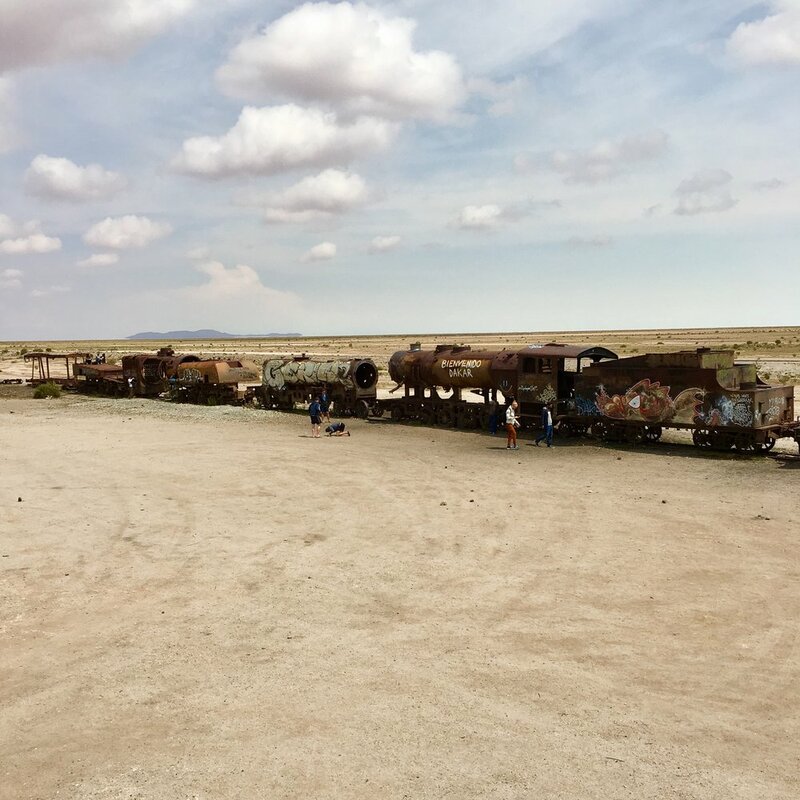 The time came, we loaded our stuff in a Toyota Land Cruiser and our group of 15 people took off in three different cars and headed toward our first stop on the trek, an abandoned train graveyard. We got there to find a long line of old trains that looked like they had not been used in a long time. They were covered in graffiti and showed their age by the distinctive layer of rust that covered them all. We took some photos and then got back in the Land Cruisers to make our way towards our lunch spot. We got there and our guides had prepared a simple chicken, vegetable, and pasta lunch for us. I was hungry from all the traveling and it hit the spot. We hung around a little bit, got a tour of a building where they break down the Salt, bag it, and sell it. We got to encounter a few locals, including a little boy and girl who were the keepers of the roadside bathroom. We got back in the Land Cruisers and started our way to the Salt Flats. I started to get more excited, knowing it would not be long before we would reach the Salt Flats. The drive was about an hour, and we went from dirt roads, surrounded by mountains to slowly getting more and more on to the Salt Flats, as the mountains slowly got further away in the background. The more we drove the more dominant the Salt Flats got and eventually it looked as if we were driving on a frozen pond. It was an amazing site, and as I looked in every direction all I could see for miles and miles was Salt Flats. We continued driving and eventually got to our first stop. 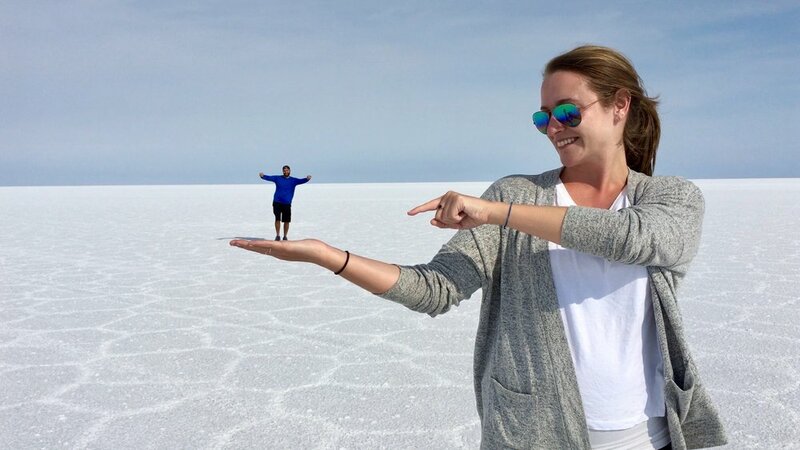 This was a chance to get out and just walk on the salt flats, take some awesome perspective photos and see the ground up close. We did a cool video of our group walking in and out of a Pringles can. We continued and got to the one hotel/restaurant that is in the middle of the flats. There was a cool statue there for the big race that occurred there and a large display of flags from all over the world. We were there for a bit and then it was time to make our way towards the reflection part of the flats and as a photo guy, I couldn’t wait. We drove a little more and eventually started to see the ground showing more and more reflection. I was happy to see this, as it is not always there. We got out and did some more photo ops. It was beautiful and I was amazed at how beautiful the reflections were. After a little bit of time there, we were on our way to our next stop. We drove for a while after the reflections and headed toward a crazy small mountain area in the middle of the flats. We could see it on the horizon as we approached and it was amazing that in this gigantic area of just white salt flats was a small mountainous area, completely covered in Cacti. We got out, and did a nice hike to the top of the range, taking in the scenery, and marveling at the fact that something like this could exist in the middle of the flats. By this time, the day had gone by and it was time to start heading towards the spot where we would watch sunset. We drove another 20 minutes or so and came to a spot where we could watch the sunset. It was a beautiful sunset, and the way the light hit the salt flats and revealed its distinct texture was a sight I will always remember. Once the sun was down, it was time to head to our resting spot for the night. We drove about 45 minutes, to the hostel we would be staying at. During our drive to this place, there were some heavy areas where the water had built up and it was as if we were driving in a small lake. We made it through all that, and got to our place. The place was nice for being in the middle of nowhere. We got settled, had a nice meal, drank some wine, talked about the day with the people in our group. We had to be up early, and headed to our room that had a gravel floor, and got a good night of sleep. The next morning, we got up, had some breakfast and then loaded up the Land Cruisers and were on our way for 2 day which was to explore the beautiful land that surrounds the Salt Flats. This would consist of snow capped mountains, deserts, red lagoons, flamingos, hot springs, volcanic areas, and so many other beautiful landscapes. We would drive, stop, drive and stop, each time the terrain was a little different. We got a flat tire along the way and sat and looked a beautiful valley while our guides changed the tire. We spent our lunch sitting on the side of the road eating a great meal overlooking a large lake that had flamingos in it while snow capped mountains served as our backdrop. We drove on, finding ourselves at the Red Lagoon next. I had never seen anything like it, except on my computer as it served as one of the default pictures on my MacBook. It was windy and chilly, and we looked out into the lagoon, watching the flamingos and their funny walk make their way through the water. We got back in the Land Cruisers and headed towards our next stop an active geyser. We got to the geyser, and steam and smoke filled the air, like a rock concert. You could smell the sulfur, and the grey sludge around us was bubbling like something out of a movie. It was an amazing site and makes you wonder about how much is happening underneath Earth’s surface. The next stop was our hostel for the night. We were told this one was not going to be nice. It wasn't too bad, and we had our typical meal, settled in our rooms, and then made our way to the hot springs that were located about a quarter mile from the hostel. The night air was cold and brisk and the idea of a hot spring sounded lovely. I braved the extremely chilly walk to the spring in only my bathing suit, a shirt and flip flops. I got there, took of my shirt, and flip flops, and made my way to the warm waters. It felt so good. Everyone staying in the surrounding hostels were there, and it was an eclectic mix of accents of people from around the world. The night sky was clear as could be and you could see every single star imaginable. We stayed in there a bit and then made our way back to fall asleep and rest up for the final day. The morning came and it was time to load up and get on the road back to Uyuni. This would be a long day of driving. We got on our way and stopped in what is called the Dali desert. This is a beautiful area that is said to have influenced some of Salvador Dali's work. We then continued, making a few stops along the way including a lunch stop in a small town that was followed by a walk to a lagoon. We arrived back in Uyuni, said our goodbyes to our guides and walked through the city of Uyuni a little bit. We stumbled upon a pizza joint that was owned by an American from Boston. We got some pies, enjoyed the company of our group and then headed to the small airport. We got on the small plane, for the short flight and made our way back to La Paz. We were greeted at the airport by our hotel transportation and headed there. The next two days in La Paz were for us to explore and explore we did. The first day in La Paz consisted of catching up on some sleep, having some breakfast, and scheduling an afternoon Walking Tour that would take us to some unique parts of the city. The walking tour met at a restaurant at 2:30PM and would be about 4 hours long. The tour started by us hopping in a mini bus to our first destination. I had seen these mini buses in South America before but was never sure exactly what they were. They are independently owned and operated and each one has a route that they stick to. You can hop on at any point and get off at any point and it is a flat rate, that is very inexpensive. This is how a lot of locals get around and it was cool to experience one and understand how it works. Our first stop was the National Cemetery. This cemetery is in the heart of the city and is where over 200,000 people are laid to rest. The layout is not what you commonly think of a cemetery where people are buried in the ground. Here, the people are stacked in cement mausoleums and the grave sites go up and down and horizontally. The families decorate the graves with mementos that remind them of the person, and colorful flowers. Local artists paint artwork on the walls, and it makes for a truly beautiful place. Our guide said that Bolivians see death differently and try to focus on the celebration of life instead of the mourning of death. He also mentioned that people can take bodies from the cemetery, and put them in their home. They dress them up and it is said to be a way to protect their house. They do this when people stop paying to be in the cemetery. It was unique and a tradition I had never heard of before. Our next stop on the tour was to get on to the Telefrico and take it to another neighborhood in La Paz. The telefrico is a cable car system that is like the subway and people use it to get from spot to spot around town. It is a way for the people who live high up in the city to get home. It is well designed and they are doing more to create more lines to get a lot of different places in the city. The ride we took was to a part of town called El Alta. This is a part of La Paz that overlooks the city. It is home to a huge market that is over 400 blocks long, and is also home to where would go next, the witch market. The Bolivians are very superstitious people and believe in a lot of different things. The Witch Market area of the city is where people go to get things to help them with different aspects of life. This is also an area where you can get your fortune told. I did not get my fortune told, but my girlfriend did, and she was told she was going to die in two years. The fortune teller was quick to add that he could reverse the curse by sacrificing a small llama and performing another ritual for a price. She declined and will take her chances that he was wrong. The witch market was unlike anything I have ever seen and consisted of all sorts of the things that the Bolivians believe help take care of evil spirits and other things. After the witch market, we hopped on another mini bus and made our way back to where we started. We said goodbye to our guide and another couple we had met on our tour asked if we would like to get a drink, and we said yes. We sat down and had a couple drinks and talked about a lot of different things. They were currently on a sabbatical and traveling for a while. They were very nice and we were happy to have met them, and hoped our paths would cross again. The day was over and it was time to get home and rest up as the next day was going to consist of a bike ride down what was called "The Death Road"
The Death Road, you hear that name and you don't think it is something you want to do, but you only live once right? The Death Road is a 40-mile trek that takes you down one of the smallest roads in the world on a mountain bike. You start at 15,260 feet and by the end you are down to 3,900 feet. It is hard, challenging and scary. I was hesitant to do it, but luckily was traveling with someone quite adventurous and whose excitement to do it brushed off on me. The day started by meeting at a restaurant at 7AM. We met our guides, and loaded up on a bus for an hour and a half trip to where we would start. One of the guys from our Salt Trip adventure was also in La Paz and tagged along with us as well. The whole time, the guide did a great job of explaining all that we would be doing and assuring us that all will be well if we stick to what he says. The more he talked, the more fear crept in and the more I wondered if I would die. I had never done mountain biking before and to do my first time in such an extreme manner seemed to to be a little crazy, but I found myself saying the phrase that I had said multiple times before on Remote Year, why not. We got to our starting point, got our gear on, and were given our bikes. We went through all the safety things again. The key thing to remember when doing this was which brake was your front and which was your rear. They specifically instructed us to use the rear break and front brake together. If you use one instead of the other, you run the chance of skidding out, or going over th front of the bike. It was recommended to use 50% on both brakes. It took some practice and memorization to get the brakes down. We then started the trek by doing a Bolivian tradition made up of a drink of theirs, which is ultimately pure alcohol. The first step is to take a shot of it, then you pour some on your bike and then you pour some on the ground to show your respect to Mother Earth or Pacha Mama as the Bolivians refer to her as. We got on our bikes and started. The first 15 miles of the trek are on a concrete road. You are going downhill, going fast, all while traffic is passing you both ways. This part was the scariest to me, and unfortunately early on, someone in our group lost control of their bike and broke their arm. Once we completed the concrete part, it was time to start the actual death road. The death road is 10 feet wide and consists of mostly rocky road. We started this part of the trek and it was indeed scary, and some points you look over the edge and just see the steep side of the cliff. I went a little heavy on the brakes, to make sure I didn't get going to fast and lose control. We stopped several times along the way to make sure everyone was ok, and of course take pictures. As we continued, I got more and more comfortable and found myself enjoying the thrill of riding down the Death Road. Luckily, no one else got hurt and we completed the whole entire trek. The end of the trek took us to a hotel at the bottom and we had celebratory beverages, and ate a nice meal. Once we did all that, we hopped on our bus for the long three-hour trek home. I was exhausted from the full day, but was so happy to have been able to do it. I slept good that night, and the next day, we would head to the airport to make our way back to Argentina to meet back up with our Remote Year family, the world had other plans though. Due to being too tired from the Death Road the day before, we never checked our flight to make sure everything was good. Well it turns out, things weren't ok, as there was a transportation strike in Argentina and our flight was cancelled. We didn't realize this until we went to check in. Luckily, we both can understand a basic amount of Spanish and the lady at the desk that spoke all Spanish to us, was able to explain our options to us. At first, she was just trying to brush us off and get us to Buenos Aires, and then was going to make us figure out our own way to Córdoba. Luckily, we asked several questions, and talked through it and she could eventually get us on flights to Córdoba, but not without stopping in Santiago, Chile first. We would fly to Santiago first and then would not be able to get a flight to Buenos Aires until the next morning, and then from there we would get a flight to Córdoba. Luckily, both of us are calm, and we could make the best of it all. We got to Santiago, got a room at the Holiday Inn right outside the airport, so we were going to be good to when we needed to be at the airport at 2AM for our 430AM flight to Buenos Aires. It all worked out, and we got to Córdoba, just a day late. This concluded this side trip to Bolivia. It was an amazing adventure filled with so many amazing experiences and memories that will stay with me forever. If you ever get the chance to get to Bolivia, especially the Salt Flats, I highly recommend it. If you would like to see some more pictures from my time in Bolivia. Please click the image below. Thanks for reading! 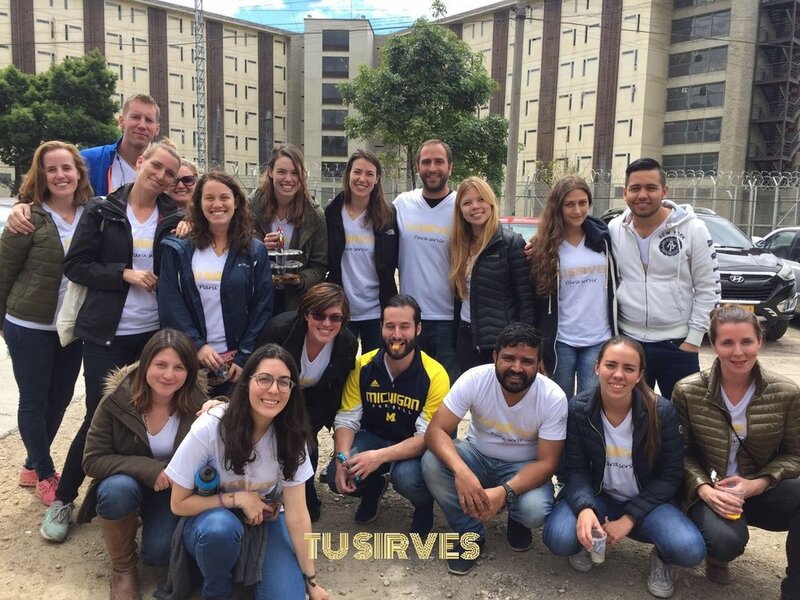 The setting for Month 10 of Remote Year was Lima, Peru and when in Peru, you drink Pisco Sours and go to Machu Picchu, right? The answer is Yes and in the middle of my time in Lima a group of me and my travel mates got on a flight to Cusco, Peru where we would embark on a 4 Day 3 Night trek on the Inca Trail. 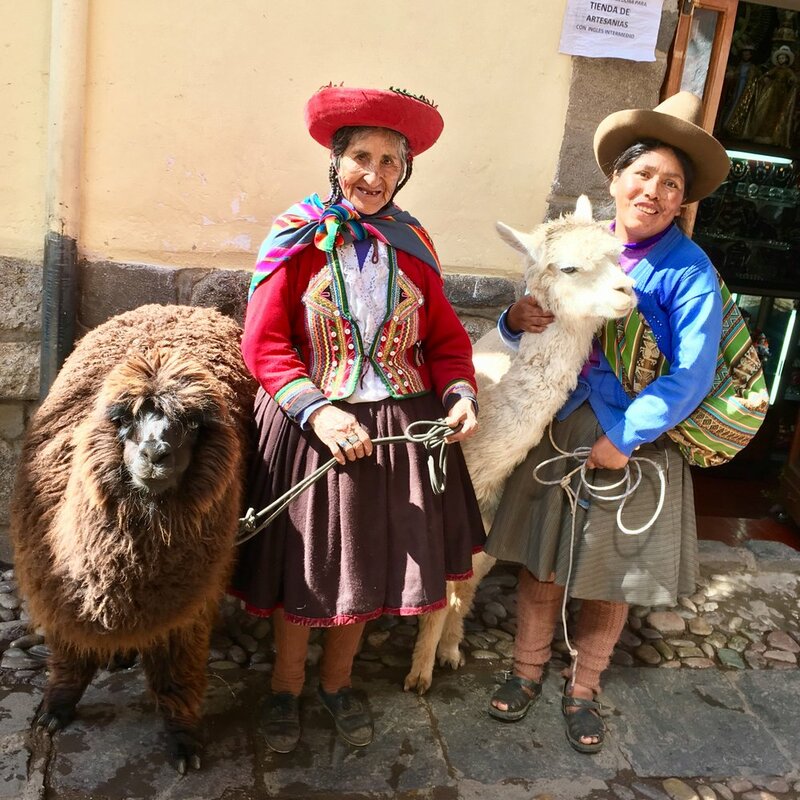 Here is the story of our Inca Trail journey! We used a company called Alpaca Expeditions for our hike. They were awesome and did a great job. I highly recommend them if you are looking to hike the Inca Trail. 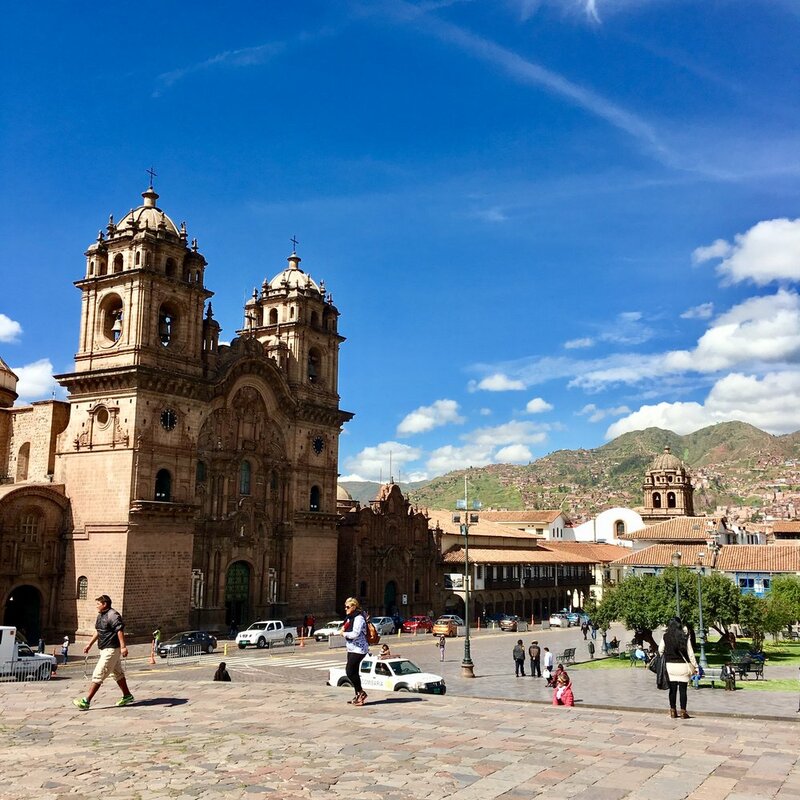 Cusco is the city you fly into to get to Machu Picchu. It is a classic South American town equipped with a square in the city center surrounded by huge churches. We got to Cusco two days before our start of our hike to get acclimated to the elevation. The elevation of Cusco is 11,152 feet, which is the highest I have been at it in my life. Upon arrival, you could feel the elevation, and it was going to take some getting used to. Cusco is a cool city, we stayed in an AirBnB that overlooked the city square and a school that seemed to have recess ALL day. During our time there, we hung out, ate, and just rested up for the trek we were going to embark on. The night before we were scheduled to leave the company we were using had an orientation that would go over the trip and give us a rundown of the 4 days on the Inca Trail. We went through the information and found out that the next morning we would need to be in the city center at 4AM to get on our shuttle. We got back to our AirBnB, packed and tried to get a few hours of sleep in before that 3:30AM wake up call. 4AM came quick and we loaded up our gear into a bus and headed towards the trailhead. The bus ride was about an hour and half away. Upon arrival to the trail head, which is known as Km 82 we found our group of porters (more on them later) setting up and loading all the gear. We were prepared a simple breakfast, got our bags sorted out and then made our way to the entrance. You must have a permit to get on the trail, which must be purchased quite a bit in advance, you also must show your passport to prove your identity. Once we got through that process, we were on our way. Our total time hiking for Day 1 was going to be about 6.5 hours. Our starting elevation was 8923 feet and we would be hiking up to 10,829 feet by the end of the day. The start of the hike was mostly flat and easy. We passed through small villages and soaked in all the beautiful sites around us. A little way in we stopped at our first Inca ruin which was called Llactapata. This was cool to see and was a great taste of the sites to come in the next few days. After spending some time at the ruin, we were back on the trail and shortly after that stopped for lunch. This would be our first prepared meal of the trip and to be honest I didn’t really have any expectations for the food on the trip. As we sat down and the food started coming out, I was taken back by the spread that was laid out before me. We have chicken ceviche, fresh vegetables, and rice. The first meal was amazing, and was a great taste of what was to come. After lunch, we had about 2 hours until we reached our campsite for the night. The hike was beautiful, not too difficult and just as the sun started to go down, we made it to our home for the night. The porters had our tents set up and we settled in. The night consisted of spending a bit of time being introduced to our porters, having tea, drinking coffee, playing cards and ending with a nice big meal before we got in our tents for the night. Our wakeup call the next morning was 5AM and Day 2 was going to be the longest and most challenging day of the trek. I have mentioned the porters a few times in my Day 1 summary. The porters the men responsible for hauling all the gear from spot to spot on the trail. They are a crucial part of this trek and we had a group of 22 men with us. The porters carry 50 pounds of gear on their back and go up and down the same trail we do. It is an amazing site to see, and I have a large amount of respect for them and all the work they do. These men are local to the area and were of Quechua decent, which is an indigenous group to the area. The language they spoke was Quechuan, which was completely different from Spanish. These men were local farmers and the job of Porter was a way they supported their family. Their main drink for energy was Chicha. This was a fermented drink that was a corn based beverage. One night one, our trek leader introduced each porter to our group. The porters have different jobs, some help with the cooking, one is responsible for setting up and taking down the toilet, and others focus on setting up all the tents. My hat goes off to them and I can’t thank them enough for all they did for us to make this trek such a memorable experience. The hard day it was called. They warned us about this day several times. It was going to be the day in which we would be at 10,829 feet and climb to 13,779 feet, then we would go back down to 11,700 feet, and climb back up to 13,123 feet, and then back down to 11,800 feet to our campsite for the night. Even knowing this day was going to be hard, you really have no idea what to expect from it, and all I can say is that it was hard. I wish I could say I didn’t struggle, but unfortunately that was not the case. The altitude and the steepness made for some tough moments. The first part of the day was the hardest, and quite frankly, by the time we reached our highest point, I was exhausted, but with 4 hours down and 6 to go, there was no other option but to keep going. One thing that has always helped me during strenuous physical activities is music. Luckily, I had headphones with me and a playlist that I could go to for an extra boost. It is amazing the power music can have on your psyche. With the sound of music blasting in my ears, I made it through the challenging part, and after 6 hours total, we made it to our lunch spot. We were served another amazing meal, rested up for a bit and then were on our way to the last 4 hours of the day. The second part of Day 2 was challenging as well, but we got to see some amazing sites and before we knew it, we were at our campsite for the night. We were all exhausted from the day, and enjoyed a nice meal, played some cards and relaxed. As our guide was explaining to us our plan for Day 3, he mentioned that if you hear any noises in the middle of the night to just ignore them. He seemed casual about it, and then tried to move on to another topic. We are a curious group and couldn’t help but ask what kinds of noises we may be hearing. He said, you know animals, and stuff and was acting weird. We pressured him a bit and asked him to tell us more. It turns out, the area our campsite has a little bit of history of ghosts and he proceeded to tell us a story of a guide who was sleeping in a tent by himself and was somehow dragged out of his tent in the middle of the night. As it turned out, I was the one who was going to be in a tent by myself that night and although I am not particularly a believer in ghosts, it was in my head. The dinner wrapped up and we played some cards and it was time to go to bed. I got into my tent, laid down, put my headphones in and proceeded to try and get some sleep. It was a long day and I was tired, so I didn’t think I would have a hard time falling asleep. This was true, and at some point, in the middle of the night, I was awoken by a strange noise coming from outside. It was an animal of some sort, and you could tell it was moving because the sound was coming from a different spot every time. I couldn’t tell you what the animal was, or what it was doing, but it eventually stopped, and silence fell upon me once again. I had trouble sleeping, and fell in and out of sleep a few times, as the thoughts of ghosts and strange animals danced in my head. The next morning came and I was still in my tent and the number of ghost sightings in my life stayed at 0. It was time for Day 3, which was our easy day. 5:30AM came quickly and Day 3 was upon us. Day 3 was labeled the “Easy Day” and we would be spending most of the day going downhill. We started at 12,073 feet and would be going down to 8,792 feet. Obviously, going downhill is easier than going uphill to a certain extent. Downhill can be tough, especially when you don’t have the most ideal shoes on, and it is a tad bit slippery. The day was easy indeed, but proved to be a challenge for me and my slick bottom shoes. The day was great, and was going to be our shortest day, only 5 hours. We continued the hike and saw some beautiful sites along the way including more ruins and llamas. We came to a stopping point on the hike and our guide gave us a run-down of how the people of the land use the leaves of the trees as arrows for hunting. He then gave us a demonstration and showed us how to do it ourselves. After the five hours of hiking, we made it to our camp. The camp was great, and was near a large ruin known as Wiñay Wayna. After we got settled in the camp, and hung out for a bit, we made the 10-minute trek to the ruins. This was an amazing ruin and was huge. We were lucky to get a break in the clouds and get some sunshine and even a rainbow. The view of the Andes mountains was breathtaking. Since we were close to camp, we could take our time at this site and explore it. We did that and spent a couple hours there. We hiked to a nearby waterfall, and then sat and watched the beautiful sky against the mountains as the sunset around us. It was a relaxing and beautiful spot. Night 3 would be our last night together, and our final dinner on the trek. Our chef managed to make a cake and we had another delicious meal, and enjoyed our time together. At the close of the night, we would gather around all the porters, and present them with our gift to them, our tips. One of the guys in our group who gained the nickname of Moses due to his long beard, created the 10 commandments of hiking the Inca Trail. He would state one, and our guide would translate it to the porters. A few of them, got some smiles, and some you could tell they didn’t understand. At the closing, we shook hands, hugged, and said our thanks. It was a great way to end the day, and once again, I can’t express my gratitude enough for the porters. Day 4, the final day and the day when we would reach Machu Picchu. Day 4 came with the earliest wakeup call of the trek. We were told we needed to leave camp at 3:30AM. 3:30AM? Yes, that early. Why do you ask? Well, apparently, the gates for Machu Picchu open at 5:30AM and to be the first ones in and beat the traffic, you must get to the front of the line. The starting point was a short walk from our camp, so we left at 330AM and were the third group to make it there. We sat down on a bench over a canopy and then watched as people upon people started showing up. It started raining and everyone was trying to get under the canopy and it was quite the scene. I ate some food, chatted with my friends, and just relaxed. Before I knew, 5:30AM was upon us and it was time to start. The whole focus of the morning and getting there early was to get to the Sun Gate and watch the sunrise over Machu Picchu. We rushed out the gate and it felt like we were going at a running pace. It was crazy. The time to get to the Sun Gate was about 45 mins. We made it, and unfortunately, like a lot of our trek, it was cloudy and foggy and we couldn’t see much. After that, it was another hour to Machu Picchu. We made the trek and made our way to the infamous spot at Machu Picchu where you see everyone get their photo taken. Unfortunately, the clouds and fog were still lingering and we couldn’t see much. We headed down to the entrance and found a café to sit at and have a celebratory beverage and wait to see if the rain would stop and the clouds would break. We sat around for about an hour and a half. It appeared to stop raining and we decided it was time to start our tour of Machu Picchu. Our guides lead us in and started giving us a talk about Machu Picchu. To be right in the mix of it and hearing the stories was amazing to think about all the history that took place in the very spot we were sitting. After we walked around a little bit, the time had come for a group of us who elected to hike Huayna Picchu to head that way and start that. 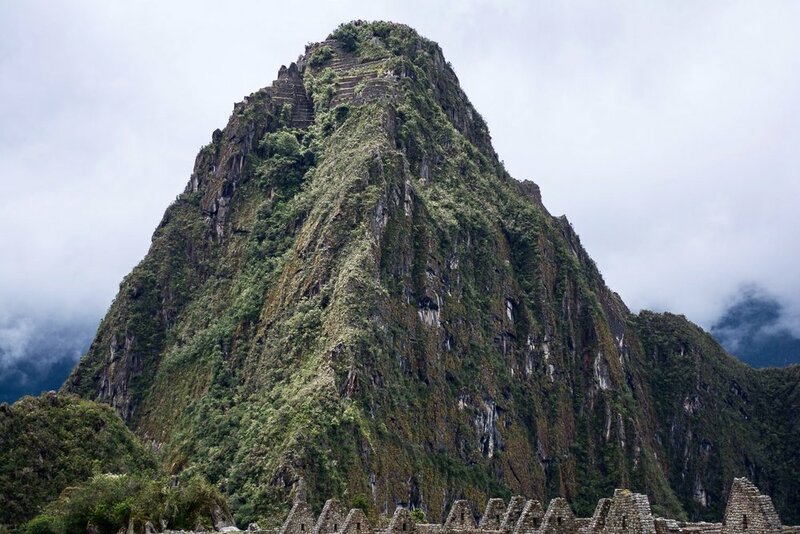 Huayna Picchu is the infamous mountain you see in a lot of pictures of Machu Picchu. I wasn’t sure what I would be getting into with this hike, and after trekking for four days, this would end up being the most challenging part of the trip. My legs were tired, the hike was challenging, and my energy level was low. However, when faced with a challenge, you must pull through. I got separated from the group and was on my own. As I started up, I got to the first steep part, and found a man throwing up in the middle of the trail. As I continued up, it kept getting more and more challenging and narrow. At one point, I came to a very thin part of stairs and found myself on my hands and knees climbing up. After a little bit longer, I was on the top. The view was amazing, and couldn’t help but stop and take in the beauty that surrounded me. My friends were on top, taking pictures, and enjoying the view as well. As hard as it was, I could not have asked for a more memorable way to end an amazing adventure. Once we got down and spent a little more time walking around the ruins of Machu Picchu, it was time to leave the ruins. We hopped on a shuttle which would take us to the town of Aguas Callientes. Here, we would have lunch, and then board our train back to around where we started. The train ride was beautiful as we moved throughout the mountains. We played cards, drank some celebratory beverages and laughed about the memories of the trek. We then came back to around where we started and hopped on our shuttle to take us back to Cusco. The shuttle ride was peaceful and it seemed as if everyone was tired and reflecting on what we had just gone through together. Our bond with our guides was strong, they were awesome, and the phrase Green Machine and Champions was a regular chant of ours. We yelled those chants a couple more times and then said our goodbyes and went our own ways. We made it back to our AirBnB, showered for the first time in a few days, and headed out to a group dinner. We laughed and talked about the trek and the night ended. The next day, we got up and headed back to Lima. This was one of my favorite side trips of my Remote Year journey. The group of guys that I went with were awesome, and we all shared an experience that I know will stay with us for our whole lives. Green Machine for life. If you would like to see some more photos from the trek, check out the gallery below, thanks for reading!